We park in the middle of the lot to squeeze in a few more steps. We set the alarm and get out of bed when it rings–even a few minutes before. In fact, we make good decisions many times during the day. Of course, we have our share of stinky decisions from time to time (“sure, I’ll take a third slice of pizza”), but that just makes us human. So, with all of the decision-making experience we have, why do we get so stuck when we’re making career decisions? Why do we get overwhelmed, frustrated, and even angry at ourselves trying to figure out what’s next for us? Why do we stay unhappy, or even worse, feel bored and wasted in our lives at work? WHY IS THIS SO FREAKING HARD?!! In updating and expanding our on-demand course, “Should I Stay or Go? Make Your Best Career Decision” I’ve been doing an extensive amount of research about decision-making. Why do you get stuck making big career decisions? Email me & tell me about it! Because while I’ve known what the clients and students who I work with get stuck on, I wanted to understand more about why they get stuck in the first place. And the data is eye-opening. Because while each of us has struggled (or has known someone who’s struggled ) with making a career decision, we all have the same magic tool available to us. Did you know that the world’s most common decision-making tool—the pro/con list — was actually invented by Benjamin Franklin? According to Chip and Dan Heath in their book Decisive: How to Make Better Choices in Life and Work, a friend asked Franklin how to decide between two options. Franklin suggested taking a piece of paper and drawing a line down the center, marking one side Pro and the other Con. The Heaths point out this surprising fact: that somehow, this process has remained our default decision-making tool to this day. But they point out that the pro/con list, while ubiquitous and accessible, is inherently flawed. You probably already know this from your own experience. You’ve probably sat down and wrote up a pro/con list. Maybe you have one right now. And, looking at it, you clearly see that one list is significantly longer than the other. And, looking at it, you clearly see that one list is significantly longer than the other. But you still can’t decide. Okay, so what’s the magic tool? The pro/con list doesn’t work because it doesn’t take into account the one magic tool you’re overlooking. Oh yes, I see you. This makes you uncomfortable. Because discomfort is where the growth is. You’re uncomfortable because you were taught that there’s no room for emotion in today’s world of work. You were told “it’s not personal, it’s just business.” Right? Me too. Well, we’ve been taught wrong. Work is always personal. And that makes decisions around our work extremely personal. Most of us want to resist believing that our best business and career decisions will come from paying attention to our emotions. We often don’t value them, trust them, and sometimes, we’re not really sure what they are. But when we pay honest, respectful attention to our true emotions, we know whether those statements are true or not. Or we know if we’re just kidding ourselves. Unlike machines, plants, or animals, human beings are uniquely equipped with emotions. 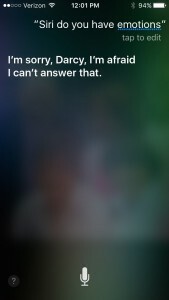 Even Siri doesn’t really feel anything. Any human-like reactions were programmed in her chip-based head by a fellow human. Emotions are what makes us messy—and marvelous. Understanding and knowing how to interpret and use emotion effectively is one of the secret strategies for a successful career today. And it’s the surprising tool you’re likely overlooking on your path to making business and career decisions that are right for you. YOUR TURN: How about you? Have you used emotion to help you in making career decisions? Email your story to me privately, or come share with our community on Facebook.